The good thing about GPs that keep you up until 4:00am in the morning is that they force the blogger to sleep on all that has happened before committing pen to paper. As a result, in the damp morning after I have read about all the penalties handed out by the stewards, I am aware that Hamilton is now classified third while Trulli slips to 12th, and poor Vettel has been castigated for causing an accident that was indisputably 50/50. 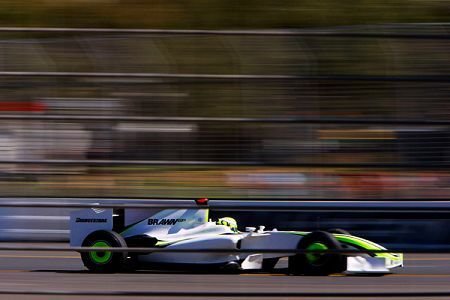 Plenty to ruminate upon, therefore, but first, due applause should be given to Brawn GP and its two drivers. All hail the mighty Ross, the happy Button and the resolute Barrichello! Now we know that the BGP 001 is so good that you can bounce it off other cars and it will hold together and keep going, you can botch your pit stop and still come out ahead - does the car have any weaknesses at all? So the one/two finish was well deserved, even if handed to Brawn GP by Kubica and Vettel. Jenson drove flawlessly, apart from his slight miscalculation in the pits, and Rubens kept plugging away. It is all very well having the best car but you still have to drive it to the finish. Both drivers were refreshingly honest in the post-race interviews as well - a welcome change from the usual careful mumblings. And so to the third man, Hamilton, unexpectedly promoted to third. His was the performance we expect from a champion (are you listening, Kimi?) and he has shown the racing ability that has been doubted by so many critics until now. Not that it worries the detractors - they are muttering about the places Lewis gained thanks to others dropping out. I guess they must have been snoozing when Hamilton made all those clean and precise overtaking maneuvers. Face it, guys, the Hamster is the real deal and has answered all your questions. Can he race in the wet? Umm, yes, he seems to be the best of them all when the track is wet. Can he compete in an inferior car? Well, to go from 18th to 3rd sure looks like it. Is he arrogant? His congratulations to Button certainly did not sound that way. Which brings me to Trulli's demotion that gave third spot to Lewis. I must admit that I am with Jarno on this one when he says that Hamilton slowed to let him through after overtaking the Toyota during its off-track excursion, also under the yellows, apparently. Rumor has it that the McLaren team told Lewis to let Jarno through again and I can believe that, considering how wary the team has become with stewards' decisions always going against them. Hamilton's surprise on being gifted the place just adds force to this version of events - clearly, he thought he had passed the Toyota illegally. Having said which, I have to point out that the stewards were right to impose a 25 second penalty, if penalty there had to be. The rules are quite clear on the options available and this was the most appropriate one. They do not say anything about exceptions being made if the race finishes under the safety car, after all. Judging by the reactions I have read so far, I am out on my own on this one (now there's a novel experience!) and it looks as though I hold a minority opinion on the Vettel/Kubica collision too. Far from being Vettel's fault, it was Kubica's and he has only himself to blame for BMW's empty points drawer so far. Consider the famous Hamilton/Raikkonen incident at Spa last year. In the run up to the first sector of the chicane we have an almost identical situation - except that Hamilton had his nose a little further ahead than Kubica did as the cars headed into the corner. Note that Lewis gives Kimi room through the corner, however - he is not going to risk his own race by closing the door to a car on the inside. Kubica did the same as they entered the corner but then cuts off Vettel as they pass the apex. Whether Robert could see der Seb at that stage is irrelevant; cars do not disappear from the track conveniently and the Pole should have been aware that Vettel would still be inside him, even if losing ground. In asserting his "rights" as the driver now in front, Kubica guaranteed that neither of them would finish the race. It is a classic rookie's error and one that many wiser heads did not commit in similar overtaking maneuvers during the race. Not that I am saying Kubica should be penalized instead - it was a racing incident and exactly the kind of thing that Bernie says we need more of in F1. Penalizing anyone in such circumstances merely discourages all the drivers from "having a go". When it comes to the fine on Red Bull for ordering Vettel to continue on three wheels, I think the stewards have it right at last. Apart from the confusion caused to other drivers (do I pass or do I not? ), the danger of bits falling off Vettel's car and causing more mayhem was so evident that some sort of penalty was necessary. In spite of Kubica's self-elimination and Heidfeld being pushed off at the first corner, I think BMW have much to be pleased with after the race. Kubica showed that the car is as good as any of those challenging the Brawn and Nick confirmed this with his performance in a damaged car that still held its own. Have a look at the fastest race laps and you will see that Heidfeld grabbed fifth quickest, only 0.3 seconds off Kubica's best time. The team may have had bad luck in Melbourne but the race wins will start coming, be assured. Another unlucky team was Williams. Rosberg did not have a good start and found himself embroiled in battles throughout the race as a result, compounded by the tires going off shortly after he set the fastest lap of the race. And Nakajima paid dearly for a minor error, one that many escaped from scot free. The car is obviously quick, however, and the team should gather serious points as the season progresses. Toyota too should be happy with the pace of their car. Once they get through their little battle with the stewards, they can expect to be in with a chance of a race win or two. And even that will be a breath of fresh air after so many years of underachievment. Force India can be quietly satisfied with their performance in this race and Toro Rosso have found another good driver in Buemi, it seems. Neither team can expect podium finishes this year but they will not be disgraced. The teams struggling in comparison to previous form are Renault, Ferrari and McLaren. Ferrari made a hash of strategy, probably caused by their need to be seen as more competitive than they truly are, whilst Renault have a lot of work to do on their car, as do McLaren. But the team from Woking have a not-so-secret weapon that will aid them in recovery. The world champion will keep them in contention and give them something to cheer about as they improve the car. He's good, that Hamilton lad. Trulli drove better than lewis today, yet once again... all the credit go's to lewis, and none go's to Trulli. Im guessing your British Clive? Trulli started two places behind lewis, and finished ahead of lewis. I guess we only see what we want to see. I must agree with Trulli's penalty. The rules are the rules. Good consistency on the part of the stewards. "Trulli started two places behind lewis, and finished ahead of lewis." Trulli finished behind Lewis; he went off. Lewis was just asked by McLaren to give the position back. Otherwise, Hamilton was legitimately ahead of Trulli. I guess we know how Brawn managed to make such a well handlign car when others are struggling to get weight forward. I wonder if Brawn have the heaviest, strongest front wing on the grid. Trulli clearly went off on his own and should not have re-taken the position. I reckon McLaren far from believing Lewis passed illegally simply did not want to give the stewards the opportunity to penalise him. Vettel and Kubica was boys being boys. A couple of young lions scrapping as Mario Andretti said after Dijon. Nuthin' to get excited about. And nothing to be penalised either. I am impressed by Hamilton's result. I have rated him highly since long before he was in F1 but I did not expect him to get points in a car that bad. If it was a badly handling car he could muscle into performing I could understand it but the car handles well. It just doesn't have any downforce and I don't know how a driver can compensate for that. I felt sorry for Rosberg at the end. He drove a great race until he put the soft tyres on and then he had no pace. Who needs a stupid rule that gives us tyres that last ten minutes and have green stripes to suggest environmentally friendliness? It will be interesting to see how the balance of power changes in Malaysia. The diffuser should have been the defining feature in Mlebourne but on the long straights of Sepang KERS should be a bigger advantage. The point with the Vettel penalty was NOT the colliision. It was that he continued to drive on the track for more than a lap afterwards, with a clearly damaged car (Source: www.pitpass.com). It was this that also got the team a $50,000 fine, as they told him to continue despite the obvious lack of safety of the car. It was clearly a 50/50 racing incident - Vettel made a mistake, and then braked slightly too early, Kubica squoze a bit too much, Vettel ran a bit wide... crunch. Nothing wrong with that, however continuing to drive unsafe is clearly the wrong thing to do. Robbie: Okay, let's ignore the fact that Trulli's car was far better than Lewis', let's forget that Trulli was so good that he went off the circuit, let's pretend that nationality has anything to do with our assessments of drivers. How much more would you like me to ignore? The fact is that Hamilton, in a much less competitive car than the Toyota, was right with Trulli when the guy threw it off the track. If you can forget nationality for a moment, you might understand that Hamilton's achievement in this race was far greater than Trulli's, given the relative capabilities of their cars. I grow heartily sick of the pathetic attempts by some to put any support for Hamilton down to blind patriotism. Those who think that seasoned F1 fans (and they don't come much more seasoned than me) give a monkey's fart for the nationality of the drivers are obviously guilty of the very sin they so happily accuse others of. Incidentally, I am English, not British. And I grew up in Africa and now live in the States. I think that makes me a lot more international than you, Robbie. Great race by Lewis. I have never had any doubts about his skills. About Vettel and Kubica, they are showing exactly what happened when you must have to race with a good car but under a huge pressure to deliver. Journeyer: I guess we have to give the stewards this one, presuming that they had access to video evidence while we were not shown the incidents. I base my assessment purely on the drivers' statements and the rumour of McLaren's instructions to Hamilton. F1 Fanatic has video of Trulli going off but, unfortunately, there is no indication of whether the yellows were out at the time. Inconclusive, therefore. Absolutely agree with you on Vettel/Kubica and on the silly situation regarding tyres. And, as you have read, my estimation of Hamilton goes up another notch. Red Bull’s Sebastian Vettel has been handed a 10-place grid penalty for next weekend’s Malaysian Grand Prix following an incident in Sunday’s Australian race. Vettel collided with BMW Sauber’s Robert Kubica during the latter stages in Melbourne as the Polish driver attempted to overtake him. Following a post-race investigation, stewards decided to penalise the young German for 'causing a collision and forcing a driver off the track’. He had been racing in second, behind eventual race victor Jenson Button, with Kubica running a close third. The fine for continuing to drive a three-wheeled car was an entirely separate matter and went to the team for telling Vettel to do so. I agree with you that no penalty was deserved for the accident, however. Becken: Good point - now we will see just how good these youngsters are when under pressure. I remember before the season Kubica being wary of the wide front wngs, and how they could easily cause accidents. The first contact between the pair was Kubicas sidepod pulling off Vettels front wing, which consequently hits Vettels right front tyre. Unsurprisingly, the combination of the two caused him to 'understeer' into Kubica. Without the front wing contact, the pass may well have worked, It' hardly be the first overtake where tyres touch the sidepods, and everyone survives. If Vettel had kept his front downforce, he could've steered away from the accident. I don't think such passes are now possible while travelling at an angle to one another. Vettel, however, suffered from being too nice and apologising, it may have got him a 10 grid penalty, but it has, at least, won him my respect. Agreed, Mr Soap, Vettel has been honourable throughout and apologised beyond what was necessary. His humility shines through and it is clear from his immediate apology to the team that he believes none of the hype surrounding him. He knows he still has to prove himself. I agree, too, with your assessment of the collision. It raises the question of whether the regulation changes have made overtaking any easier as intended. From what I saw in the race, it has had a marginal effect at best. Many of the faster cars were stuck behind slower cars for large segments of the race. KERS has given some cars an advantage when passing but they pay for it in poorer handling. I agree with you about Trulli, Clive, actually all your thoughts about the race. I am very impressed by Buemi. I also agree with the comments about Vettels apology. In my eyes it was 50/50 and should be filed as a racing incident. It's a curious question, but not one I'd say can be answered so quickly. Right now, I'd be tempted to say it has had something of a positive effect, incidents like this aside. I have to admit the only instance of someone being really held up by someone much slower than them was Trulli by Fisichella, and I've never really rated Trulli as a talented overtaker. Is this just that my memory is bad? But even if there is more overtaking, whether that's just because the field has got closer, or down to the regulations is certainly a matter for debate. KERS is also inconclusive. It certainly didn't seem to help in qualifying - although Hamilton only got one quick lap in, which given how quickly the track improved could've been much better. From what Alonso said, the Renault system either isn't working so well or they don't know when to use it yet. The Ferrari drivers were certainly using it in different patterns to Hamilton whenever the graphic showing its use was present. Shame they never showed Heidfeld or the Renaults though. What a great race! I am so happy for Brawn as they have clearly done a great job and they look as if they have speed in the bag judging by jensons short bursts of speed to open gaps up. Hamilton showed that he is indeed a racing master and every bit worth the title of World Champion, his passing moves were sublime and he remained cool. The Mclaren does not look as bad as I thought. It seems very stable and well balanced and there was no sign of Lewis fighting it. It clearly needs a little more downforce which I am confident the engineers will develop quickly. Once it has this I imagine it will be very competitive especially as the ferraris seem to be a little twitchy. One great thing was to see how close the cars can now follow through the corners, no more dropping back and having to make it all back on the next straight. I believe Trullis' penalty is the correct decision under the circumstances (although the coverage did not show the actual incident) however I could also understand if Trulli feels a little hard done by. Vettel and Kubica should both be feeling very silly right now. Vettel could and should have backed off more and Kubica could and should have given vettel more room. No penalties should be given as they were racing and it was clearly a mistake on both their parts. One more point. I am not sure if I am being a little too pessimistic, but I could swear that after nakijima met the wall, they left the safety car until Button had pitted. It seemed an age before it came out........ Not that I am complaining, Jenson does deserve a little luck. If you look at each individuals fastest laps, many in the top 10 had fast laps at the bottom of the sheet. Buemi pulled right in front of the leader(?) in the pits and it was ignored by the press. Last year, Massa did that and the press went on for days. Ferrari's strategy was not much different then BMW's ans could have brought results if not for reliability yet again. Overtaking did seem to be a bit better. Tire compounds need to be more consistent from hard to soft compounds. The soft compound was pathetic. Roger: Actually, we were joking about the front wing being used to add weight to the nose - British sarcasm, perhaps. It seemed to follow from the reflection on the strength of the Brawn's wing. It is worth mentioning, that Renault tried placing their KERS storage in the nose in an attempt to get more weight in the front. They may have changed that since the beginning of testing, however - at least, that unsightly bulge under the nose seems to have disappeared. Perhaps they found out about your centre of inertia theory the hard way, Roger! That was a too weighted joke for my poor english, I think... :-)). And let's say that those guys at Renault must be way smarter that we are.... although..... just looking that piece of junk and bricks that is given to the Fred for second year in a row.... Maybe we could get a well paid job there. If you have a call, let me know, bro!! Mr Soap: Trulli's reputation has been that he is very fast over one lap but does not race very well. That may be the result of overdue caution when overtaking but, in any case, he has begun to put the reputation to bed in recent years, having raced very well since Ralf's departure from the team. I seem to remember Raikkonen being held up for several laps behind Fisichella, Barrichello had great difficulty getting past Rosberg and Raikkonen (actually, he had to wait until they pitted) and Massa managed no passing moves after dropping to 13th in his third stint. It all looked very familiar to me. Clive, Massa's pace was awful after his last pit. It take him a few laps to get behind Trulli who was already stuck behind Fisichella. Also Barrichello previously to the first pit was having some problems with that damaged wing. One thing about Hamilton pretty good race: he struck me as thre only driver using Kers well. Lee: The telling thing about the McLaren is given in the list of fastest laps - Hamilton's best was only 13th quickest. To get as high as he did, Hamilton must have squeezed the best out of the car for lap after lap. In other words, he was driving on the edge right through the race, something that F1 drivers rarely do (hence their fluctuating times from lap to lap) and only the very best can manage. Consistency in times is more frequently seen, some drivers such as Heidfeld being known for it, but consistency at the ragged edge is reserved for only the supremely talented. Steven is correct in saying that the car handles well but lacks downforce, I think, and that is something that the team will solve gradually as the season progresses. I was probably a little hard on Robbie up there regarding the nationality thing but I see so many similar comments on F1 Fanatic that I had reached boiling point when I read his comment. It really is something that F1 fans should know is irrelevant. Aracer: Interesting observations. Not sure about the fast laps, however - I only see Barrichello, Buemi and Hamilton of the higher finishers with slow fastest laps. The rest of the top ten seem to have all put in very respectable times. I missed the move by Buemi in the pits - do not recall it at all. I recorded the race, however, and must remember to keep an eye on Buemi when I watch it again. True regarding Ferrari's strategy, although their first mistake was starting on the softs. Their car was not as good as the BMW, however, and I doubt that Raikkonen really had a chance of finishing on the podium as they are claiming. The soft tire was not a viable option at all, I agree. To force teams to race a stint on tires good for only a few decent laps seems insane to me. But then, when has that ever bothered the FIA? Roger: When Renault were let off the charge of spying because, according to the WMSC, their engineers had not understood how McLaren's J-damper worked, I jokingly suggested that the Renault engineers must be pretty stupid not to get it when others proved quite capable of working the thing out for themselves. Some thought I really meant that, completely missing that it was sarcasm intended to show how empty was the WMSC's reasoning. So I seem to be gaining a track record in being misunderstood! Agreed regarding Hamilton's use of KERS - it looked like intelligent and smooth use of the extra power. and race lap times he must have been consitently so near the limit the whole race. Something Schumacher was remarked for, but when you say that kind of thing you get jumped on. banged out his race results in this way. The BBC showed hamilton's onboard with telemetry as he followed and marginally closed the toyota (trulli I think) with alonso behind for a while. Lovely battery icon, showing what he was doing with it. Beautiful first race, and so much to look forward to from so many teams for the rest of the season. later deemed admissible by the FIA result revision comittee. Toyota, really sorry, but welcome to Mclaren's world. mwahahaha. As Mclaren is so out of it FIA punishment division have decided to find new whipping boys for harsh and unusual punishment. timing of the removal of second Safety car? Peter: Hey, I can't jump on you if you agree with me! Your assessment of the 2007 season is pretty accurate, I think, especially in view of Hamilton's performance today. As soon as Vision F1 have their re-run of the race up, I'm going to watch Lewis' times lap by lap. SpeedTV had the KERS graphic too - very interesting. I still think it's six of one and half a dozen of the other, however - Lewis would have been quicker with more ballast to play with; KERS just allowed him to make up the loss on the straights. Peter (again): I pity Toyota if they really have become the FIA's whipping boy this season. What better way to drive them out of F1? Having watched most of these drivers entire careers, I think Lewis is most assuredly one of the most talented and did exactly what he needed to do; not only for his critics but for McLaren as a whole. He should be commended. I'm absolutely not serious about wishing such a role on Toyota. etc.... and likely handed it back. receive precisely what Mclaren are afraid of). sports team feels they (and perhaps do) have to take this approach. position and win it back in court. We don't need rule changes, we need the rules we've got to be applied reasonably and fairly. Negative Camber: Thanks for the compliment (although it was a morning's sleep!). Yes, I stuck my neck out a bit over Hamilton's wet weather driving but I feel pretty safe doing it. Vettel has his reputation in the wet thanks to the handling of the STR3 in such conditions and to Monza, 2008. We tend to forgive Fuji, 2007, since he was so young at the time, but then ignore Bourdais' performance at Monza in the same car and conditions - he was almost as quick as Vettel throughout the race. Hamilton, however, has proved himself much quicker than his team mate on a wet track, even more so than in the dry. Rubens and Button are both pretty good when it rains, so is Alonso. And it is Alonso that allows me to say that Hamilton is better - give Lewis water on the track and he was quicker than Fernando when they were team mates. Peter: Hear, hear. The FIA has succeeded in confusing so many issues over the past few years that no one can be sure of anything anymore, even when it is written in black and white in the rulebook. Clive, gosh again I agree! The folklore goes that STR at Monza made the gamble on a full wet set up, whereas Mclaren Ferrari and others in the title chase compromised. STR had more to gain from an extreme gamble, while those with more to lose had to minimise their worst case loss by taking compromise setup. the field at one point on a poorly setup car. just monza), but I've never seen the kind of Spa/Monte Carlo/Silverstone grade superiority that is so huge that the few tenths between cars clearly has nothing to do with it. There are usually a few wet weather specialists on any F1 grid - guys who leap to the front as soon as it rains. Button and Barrichello would be modern rain specialists and Hans Stuck Jr was the man in the 70s. But occasionally we get someone whose ability on a wet track seems magical - Senna was one (Monaco 1984, Donington 1993) and it may be that Hamilton could be another. Aracer: Well, I've watched the Buemi pit stop and cannot agree that it was anything like Massa's offense in Valencia last year. Buemi is released in front of a Brawn, but there is nothing illegal in that. The shot was squashed up so that the cars looked closer together than they were anyway. I agree Clive. Barrichello at least should had an easier time given by how good Brawn looked. Interesting he is claiming that Heikki broke his diffuser in their fast lap. Also you are probably very right that Ferrari need to look faster than they were played a whole in their bad performance. Massa told brazilian press that as soon as it became clear saturday that both Red Bull and BMW were faster than them, he and Rob Smeadley decide to switch to a three stop strategy which fell apart thanks to Nakajima's SC. BTW, looking at Massa speaking today one feels that Ferrari was really caught off guard by their actual pace this weekend. You are probably correct about the safety car conspiracy, it was probably just coincidence that the safety car took a ridiculous amount of time to get out and when it was called out it exactly coincided with Button leaving the pits. It also seemed strange to then keep hold the field up while seemingly they had cleared the williams out of the way before the safety car had even come out! Later on when vettel and kubica crashed the safety car call out was practically instant. Also if you watch vettel and kubica crash from above it was a very nicely synchronised. They went off at different parts of the track at exactly the same time. 10 points for presentation there. I am still annoyed that either of them were punished. At most drivers should be given a fine for that sort of incident as it was neither dangerous or intentional. On the tyre issue. I am still unsure about the whole thing. It is clear that when the softs go off it is affecting some cars more than others and they do go off a little too early. However the gap last year between compounds was so small that to some cars it made little difference to their tyre wear. I think they may just have over compensated as they now seem only a little harder wearing than the old qualifying tyres. One thing to say is that in Formula 1 it's not the points you get when you expect to win that win you the championship, it's the points you get when you don't. Lewis showing yet again that he is very canny at that. It may be academic with Brawn so far ahead. But if the diffusers are banned in a few weeks and we end up with McLaren and Ferrari back up the pointy end of the grid those 6 points might win a championship for him. Being nationalistic, and since you have brought up past rain masters, mustn't forget Gilles Villeneuve 11 second advantage in qualifying at Watkin's Glen. Lee: Since I don't agree with the two-tyre per race rule anyway, I see nothing wrong with the two compounds having similar performance. The FIA insisting that Bridgestone introduce a greater disparity between the tyres looks like manipulating the sport fir the sake of the show and without regard for safety. When will they learn that we could not care less about the tyres, we just want to see racing? Alex: Thanks. Absolutely right about the points, especially when you consider that it was the points Hamilton did not score in Spa last year, thanks to the worst stewarding decision ever, that nearly lost him the championship and allow Bernie to say that Massa should have been champion because he won more races. Arun: You're right, of course. I have been trying to find an equally dramatic photo to replace the old thunderbox Honda but no luck so far. It will change soon, I promise.